Unroll 1 can Pillsbury™ refrigerated crescents; firmly press perforations and edges to seal. Cut into 4 rectangles. Sprinkle each with 1 tablespoon grated Parmesan cheese. Starting with 1 long side of each dough rectangle, roll up each rectangle. Cut each into about 1/2-inch slices; place seam side down on ungreased baking sheet. Bake 9 to 12 minutes or until golden brown. Remove from baking sheet to cooling rack. Meanwhile, in medium bowl, stir together 2 packages cream cheese, room temperature, 1/2 cup shredded Mexican cheese blend, 1/2 cup plain yogurt and 4 jalapeño chilies, seeded (if you prefer less spice), diced. Season with salt and pepper to taste. Transfer mixture to ungreased small baking dish; spread into even layer. In small bowl, mix 1/4 cup bread crumbs and remaining 1/4 cup grated Parmesan cheese. Sprinkle evenly over dip. Bake about 25 minutes for until bubbly and lightly browned. Cool slightly, about 10 minutes. 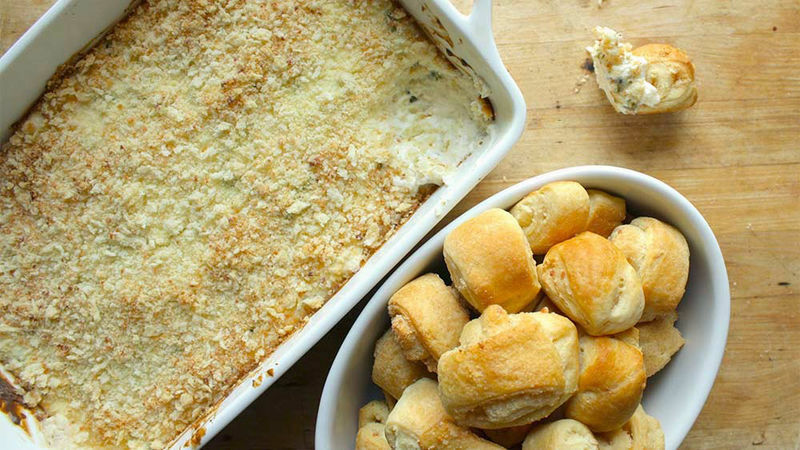 Serve warm dip with dippers. Make your own bread crumbs by pulsing a few slices of day-old bread in a food processor.